Ethics Committee imposes light punishment on Arab MK who verbally attacked Likud's Dichter in a television interview. 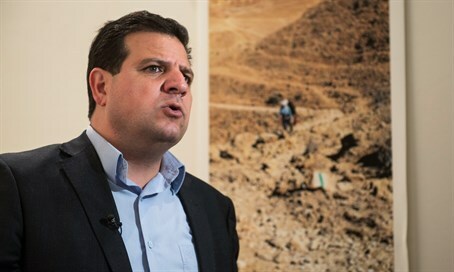 The Knesset Ethics Committee on Monday decided to reprimand MK Ayman Odeh, head of the Joint List party, after he called MK Avi Dichter (Likud) a “murderer” in a recent television interview. In the interview in question, which aired earlier this month after the Knesset's Constitution Committee approved a bill that would allow the Knesset to remove members with a majority of 90 votes, Odeh claimed that there are Jewish Knesset members who “murdered Arabs with their own hands”. He singled out Dichter, who was in the past head of the Israel Security Agency (Shin Bet), and claimed that he “sent people who killed [former Palestinian Authority chairman Yasser] Arafat, as well as well as [senior Hamas leaders] Ahmed Yassin and Rantissi, and he is in the Knesset. He sent people to murder other people." In its decision to reprimand Odeh, the Ethics Committee said that due to the fact that he does not have previous disciplinary infractions, there is no point in imposing a heavier punishment on him. “The argument that due to a lack of similar grievances the committee decided not to deal with this complaint as well, is unacceptable and I do not intend to let it pass,” he added. MK Ya'akov Perry (Yesh Atid), who was also signed to the complaint against Odeh, said he accepted the decision but also criticized Odeh.